By Swati Dasgupta : The thrill of driving on the beach is a rare privilege and if you are in Oman, consider yourself truly privileged. Be it any time of the year, you can drive alongside the coastal roads and soak up in the charms of Oman and its many vistas. And that’s exactly what I did few weeks back on a warm sunny Friday morning. Paying no heed to the bright sun I took the coastal road of Sur to visit the quaint village of Al Ashkarah to immerse in the beauty of the pristine beaches and the rolling waves. 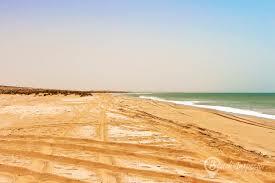 As you drive from Sur towards Al Ashkarah village you pass the majestic sea and the golden sands in almost two hours. While the beach stretches all the way from the village straight up to the Al Ashkarah Beach Resort, the spectacularly scenic coastal drive is one that you will truly enjoy. Known for its fish, especially sardines and cuttlefish, once you are passing through the village you can stop by one of the restaurants to have a bite of grilled cuttlefish. Fresh and delicious to the core, this fishy affair is certainly not to be missed. Meandering through the lanes and the by lanes of the village and after losing track of the right direction (having a GPS in your car is a must), we finally reached the Beach Resort. Once at the resort the activities are plenty. Be it kite-surfing or jet-skiing, the beach is considered to be ideal for all water sports as the sea conditions for surfing are very good, especially during summer. One can also opt for kayaking and kayak boats are available. Apart from boat trips one can also go for quad bike rides. Not being quite keen on trying any of these I spent the rest of the evening watching the sun gradually disappear beyond the horizon. Once darkness sets in the rustic lights at the resort brightens up the whole area. Al Ashkarah Beach Resort is minimalist but yet has all the facilities that’s needed for a comfortable stay. Most of the rooms open up to a balcony facing the sea and is the perfect place to gaze out at the waves from your own private seafront balcony. If you are spending a night at Al Ashkarah, no matter however late you are the previous night, rise up early in the morning to watch the sunrise. When you watch the sun rise above the glistening waters and see its golden rays fall on the ripples of the waves, you will tell yourself, ‘this sunrise was worth waking up for’. I didn’t have my camera along but I still managed to grab few mobile shots of that awe inspiring moment, just when the sky woke up to a copper glow. At Al Ashkarah walking down the beach and collecting seashells can be your favourite pass time early morning till the sun rises to full glory. And before it gets hot try walking barefoot on the sand and feel its softness. Far off I could spot a group of fishermen with their nets as fishing is an important occupation of this village. A little distant away while some tourists were busy trying to fix their net for their precious catch others were getting ready for quick swim. After a hearty breakfast spend the rest of the day relaxing and head back home with many memories of the sea, sun, and sands.